Under a shady bridge in Yurakucho is an old looking lane with many traditional-like eateries. The atmosphere is nice, but with only one problem. These stores are all rather new, here since 2010. 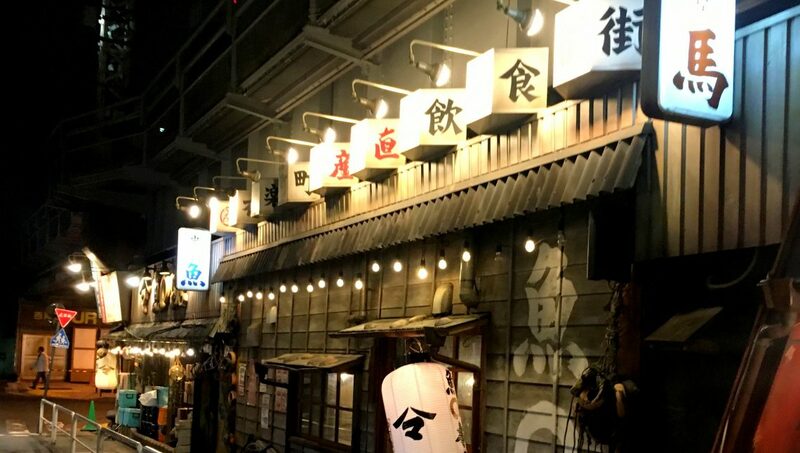 As izakaya (Japanese traditional pub) are available on any kind of theme in Tokyo (from horror to robots restaurants), also the showa-style eatery has become a popular topic around which to build a restaurant. Several chains have emerged that relive everything related to the Showa era (1926-1989). These restaurants try to recreate how the generic eating and drinking place used to be 30 to 60 years ago, which includes how the menu is being displayed, the building materials, the type of food and more. For example, the Hanbey Izakaya chain has been all the rage the last couple of years, with a very retro feel that is at the same time quite cheap and hence attracts a lot of students. Prominently featured in this chain are old manga and old toys, while at the same time playing music popular during the early to mid Showa period. I frequented that izakaya chain several times and appreciated the low prices and atmosphere. Inside Uomaru Honten, a guy was running around with a guitar to create more atmosphere. So one night after work, I found myself near Yurakucho and in need for a drink. A colleague of mine knew a new place, so without much ado we set out to go to Yurakucho Sanchoku Inshokugai, which translates as farm-fresh izakaya street. I must say, even though I knew it were replicas, it looks all pretty real as there is an extreme attention to detail. This was apparent in the signs and lanterns outside, how the dishes are advertised on improvised paper sheets, dangling light bulbs from the ceiling and some cooling fans thrown in for effect. One thing is different though: the prices. Expect to pay a premium, so they definitely cater to a bit more upscale audience than Hanbey. In fact, the main selling point of this group of restaurants is not this oldish atmosphere, but rather bringing the regional cuisine to Tokyo. You get the background of the showa-style restaurant as an additional treat. The store I visited was focused on fish from Shizuoka prefecture (the largest restaurant of the group). Inside the store was an old fishing boat in which several tables were placed, adding to the atmosphere. The food was of decent quality, fresh sashimi and all kinds of other fishy treats, from large baked horned turban (sazae, a type of sea snail) to eel (unagi). There are a couple of lanes in Tokyo that are full of more authentic izakaya and small eateries such as nearby Gado shita, several streets in Shimbashi or Omoide Yokocho in Shinjuku. However, as they receive a lot of attention in recent years, they get overloaded with tourists, while Sanchoku Inshokugai seems to more cater to the local public and salary men. Yurakucho and Hibiya stations are connected with each other.